The University of Warwick is in Coventry. The nearest train station is Coventry or Canley and not Warwick! If you go to Coventry train station, you will need to take a bus to get to campus: 11 (20-30 minutes) or 12X (12-20 minutes). 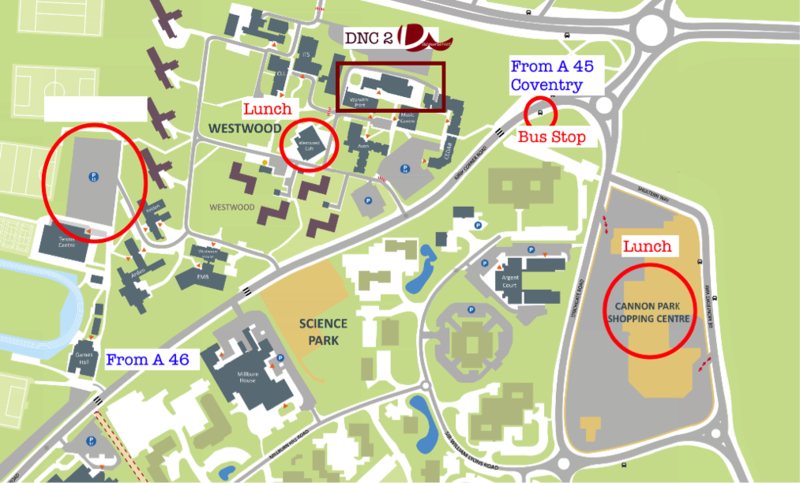 Bus 11 will take you nearer to Westwood Teaching Centre, where the registration and most talks take place. You need exact change (2.10-2.90£) and you may consider buying a daysaver ticket. Bus 12X will take you to the bus interchange in the main campus and it is a 15-20 minute walk from there to Westwood Teaching Centre. From Canley train station, it is a 20-30 minute walk to Westwood Teaching Centre. There is a carpark at Westwood Teaching Centre. It costs £2 for 4 hours and £4 all day. If that one is full, Car Park 13 is also on Westwood campus and has the same charges. There are also carparks at the nearby Cannon Park Shopping Centre, Aldi and in other parts of the campus such as Car Park 15. The campus is big and the conference site (Westwood) is not exactly in the centre. The Westwood Teaching Centre is located on Kirby Corner Road, Coventry, CV4 8EE. We will try to put up signs. However, you will have to study a map to find us. To find directions on how to get there, please use Warwick's interactive campus map. The plenary lectures would be at Westwood lecture theatre in the building, Westwood Teaching Centre. Paper presentations will be held in the rooms in Westwood Teaching Centre (in purple below). The poster session will be held in the foyer of the building, where the registration desk is.